Some retreats are open to all comers, and some are geared to specific professional groups or leadership teams. All are designed to enlist the power of wilderness as an ally in healing the growing rift between human nature and wild nature. 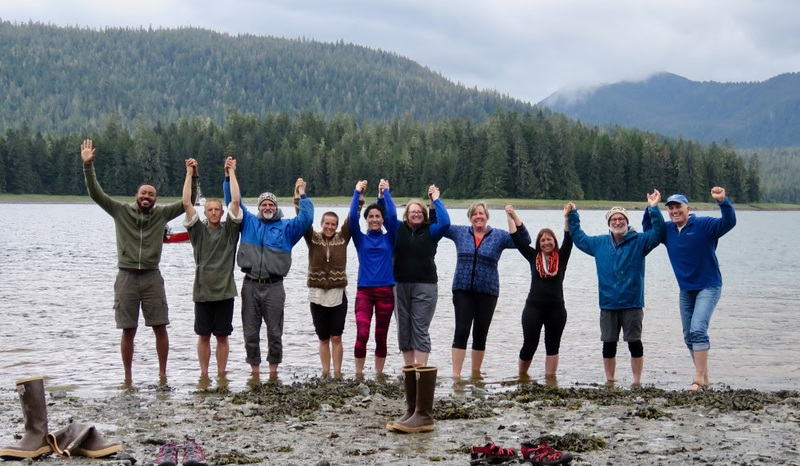 Inside Passages retreats combine a rich knowledge of Southeast Alaska’s natural history and ecology with extensive experience in mindfulness practice and teaching. These retreats offer a rare opportunity to come home to ourselves, and home to the wider nature to which we all belong. Based out of Keene Channel Lodge, at the junction of the Wrangell Narrows and Beecher Pass, Inside Passages retreats are held near the northern end of the famous Inside Passage shipping route that runs for 1000 miles along the Northwest Coast from Puget Sound north through British Columbia and Southeast Alaska. Our retreats are nestled in the heart of the Tongass National Forest, the largest and wildest temperate rain forest left on the planet. Drawing upon the practice of mindfulness meditation, qi gong and yoga, we also enjoy daily contemplative kayaking in the sheltered waters, islands and channels surrounding Keene Channel Lodge. Some of our retreats feature a two-night camping experience at the nearby Castle Islands in Duncan Canal, and some are based exclusively at the lodge. Together we re-discover the power that lies within, when it is linked to the power of wild nature. We remember our more-than-human wholeness, and in the process become more human ourselves. We believe that the cultivation of this capacity, this direct experience of wholeness and spaciousness, is vital not only to our personal well being, but to the healing of our world. To be present to the enormity of the challenges we face with a steady, resilient heart and mind, is an act of love that has never been more needed. Inside Passages retreats join a spirit of adventure with this quest for a deeper wholeness. Please join us on this adventure of a lifetime.